My first day of class is at the Zardosi School of Embroidery. 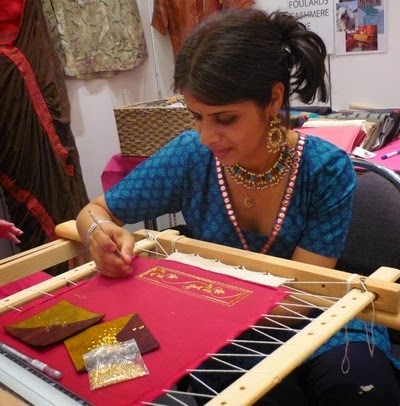 Zardosi is an Indian embroidery technique and a word meaning 'those who work with the yellow (the gold)'. The classroom facilities are small and full of beautiful Indian fabrics richly embroidered. We are three students, each of us with our individual work. One of the students is Jeanne. She works at a Haute Couture workshop. I want to learn the handling of the Indian crochet (Aari). I thought that it could be easier than the technique of Tambour Work (with the hook of Luneville), I was wrong. This is equally difficult. The hooks are handmade in India from broken spokes of bicycle wheels. 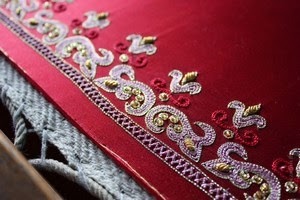 So, in my piece of embroidery there will be a little of rickshaw from India. 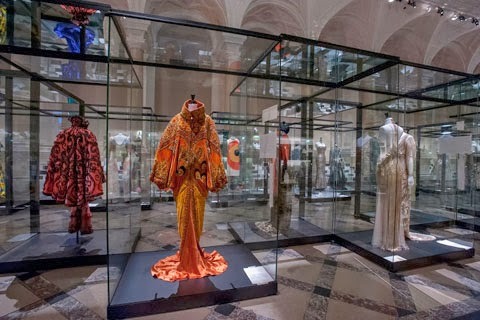 The first one, The Paris Haute Couture exhibition, was presented at the City Hall of Paris. FABULOUS! 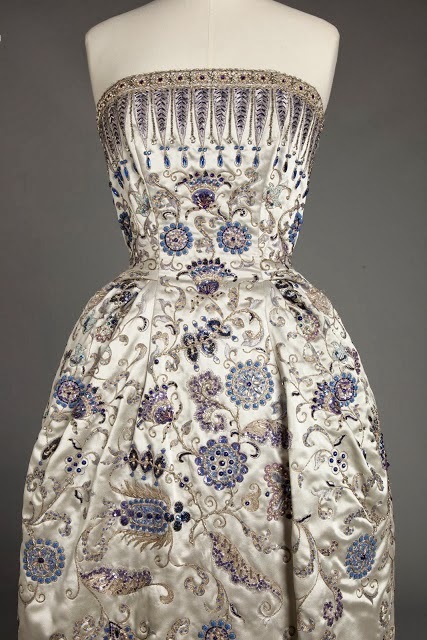 Sparkling embroidery and beautiful, high technical skill, imagination and flawless execution. An extraordinary exhibition. My favorite is the Sheherazade’s dress, created by John Galliano for Dior’s. And also the dress created by Ricardo Tisci for Givenchy’s. I wanted to see how the French opening exhibitions occur. In fact it's like in Quebec. Virginia Rochetti presents embroidery paintings computer assisted design. These are large horizontal banners, hanging freely from the walls. Some small discrete eyelets or nails hang them up. Her color palette is restricted to brick red, gray, brown and black. The subjects are dark, violent, and want to act as whistleblowers for the society. The news, the press are an endless source of inspiration for Virginie Rochetti. 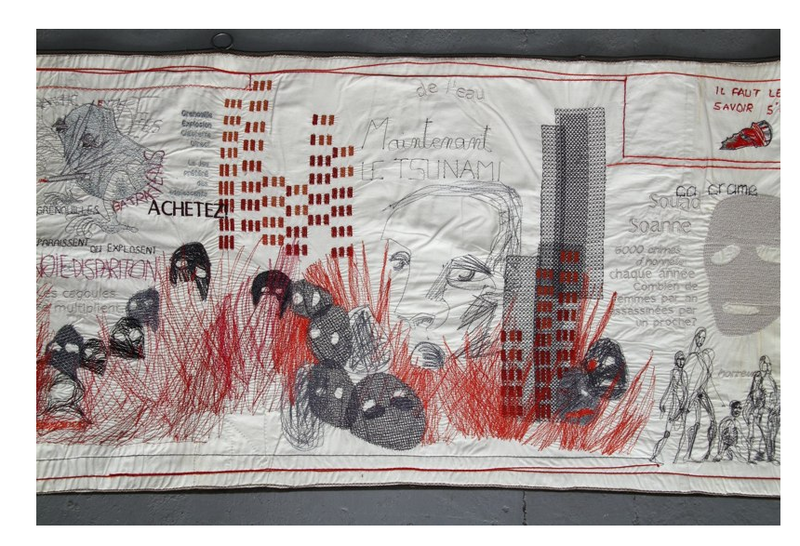 By the embroidery and the textile arts, she wants to participate to the great debates of our contemporary society. With reference to the Bayeux Tapestry, Virginia Rochetti embroidered two years of news on a strip of linen fabric of 7 meters in length. 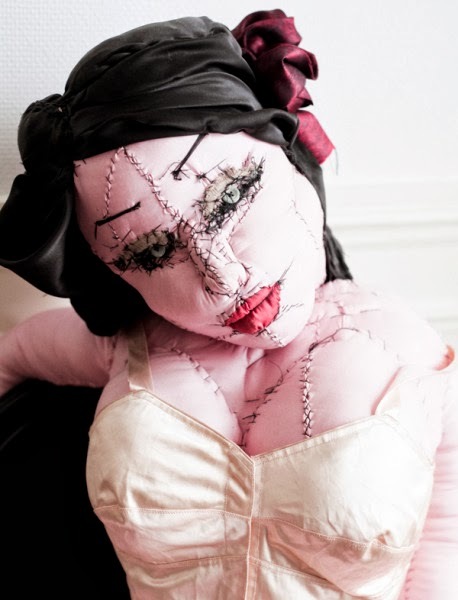 At the same gallery, Anne-Valerie Dupond’s exhibition presents rag dolls whom are embodying pinups, those archetype characters from the 50s. This is a three-dimensional work using textile, the characters are buxom ladies in bikini, with smiles. But in contrast the seams of the dolls are bluntly visible. Uneven seams, poorly made, with black wire on pink flesh, stand out and disfigure the perfect image of the women of dreams we usually see on the film posters. I went to the apartment of the Japanese artist, Rieko Koga. She stitches large pieces of embroidery on all kinds of fabric, large spontaneous embroidery, stitched very freely, with no technique. This is the area of total spontaneity. She adds in her paintings scraps of phrases, words, the titles of her work. The color palette is dark. Really enjoyed this blog, enjoy this experience Renee Marie. This sounds like such a wonderful opportunity for you. Thank you for sharing all you are seeing and doing, Renee Marie - it is fascinating! Chainsaws, Balls and a Spectacular Day!